Active learning has been defined as “any instructional method that engages students in the learning process, and requires students to perform meaningful learning activities, and to think about what they are doing” (Prince, 2004). The important part here is that students take part in meaningful activities which require thinking, in direct opposition to passively receiving information from their teacher. 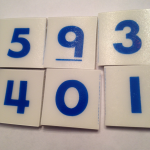 Number Tiles: These can be purchased from https://www.marcycookmath.com/ or made from one-inch square foam or wooden tiles. Each student gets a set of ten tiles, numbered 0-9. During the session, I shared two games with attendees: Close to 100 and Close to 1000. In Close to 100, two students flip over their tiles so that they cannot see the numbers, and draw four. Each student then tries to create two 2-digit numbers which add up to 100. The goal is to come as close to 100 as possible. The student who is closer to 100 is the winner. In Close to 1000, the same process as above is repeated. The only difference is that students draw 6 tiles, and try to create two 3-digit numbers which add up to 1000. QR Codes: These can be utilized to infuse technology in the classroom, and provide an easy way for students and teachers to link information. http://goqr.me/ is an easy to use QR code generator, and students can link to a URL or text, or several other options. QR codes can be placed at the front of a book, linking to a book trailer for the book, an excellent way to motivate readers! Link videos or maps that further explain a setting from a novel. Go paperless using QR codes. Link to announcements, assignments or projects using the codes. Choice Boards: These can be utilized to differentiate instruction based on readiness, interest, or need. Assignments can include activities to meet different learning styles, and adapted to any subject or content area. https://daretodifferentiate.wikispaces.com/Choice+Boards provides several templates and samples, as well as an excellent video describing how Choice Boards work. Provide a choice board with differentiated activities for mastering basic math facts. Appeal to multiple learning styles! An assessment choice board provides different opportunities for students to demonstrate learning during a social studies unit. A learning menu can allow students who are “early finishers” to make choices about creating additional products to extend their learning. Exit Tickets: These are used by students to actively reflect on a lesson or unit of study. Teachers can utilize the low-tech version (Sticky Note- Some teachers have a “What Stuck With Me” poster, where students can deposit their exit tickets). Several high-tech options are available as well, including https://padlet.com/. Padlet allows a teacher to create an online “wall” where students can share their exit tickets or collaborate with other students to reflect on their learning. There are many options for engaging students in active learning in the classroom. I have shared several of the resources that I have seen used successfully in the classroom. I invite you to share other strategies or resources for active learning in the comment section below.